Oh yah. 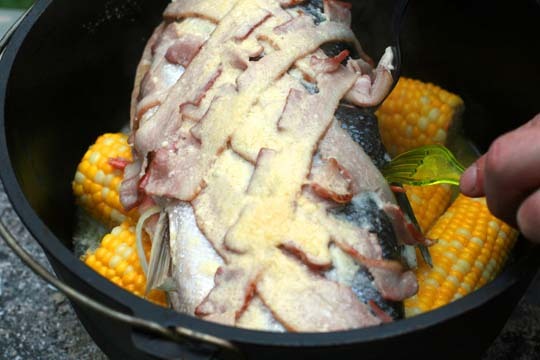 Salmon and corn AND bacon. It IS camping after all. This meal is dead easy to make once you have the ingredients. I think bacon and corn were meant to be together. But first, let's get the briquettes into the chimney. A little bit of newspaper at the bottom (below the inside grate) and all the briquettes we need in the top. Apply match. Voila! You can see these coals aren't ready yet. Maybe another 5 or so minutes and they will be all aglow. Ah. That's better. Here they are on the lid working their hot hot hot magic. Place husked corn in bottom of dutch oven with a cup of water. Season inside salmon and place it on corn. Criss cross the bacon on top of the salmon. Cook for about 30 minutes with 16 coals on top (to crisp the bacon) and 8 coals underneath. Check the progress about half way through and sprinkle parmesan cheese on top of the salmon. The salmon is done when the flesh flakes and is no longer translucent.